After spending our Easter weekend at the beach, surfing two days in a row and soaking up the sun (still a bit of a hit and miss yet a major improvement on the constant rain from the last few weeks), I thought I would take you to Montauk to discover this cool and spacious surf house. The first thing that caught my eyes was the black cladding, which is a feature I really love and hope we do in our next home. Renovated by New York* studio T W Ryan Architecture, the house is located on a sandy lot in Ditch Plains – a famous surf spot in Montauk, which is a village at the east end of the Long Island peninsula. 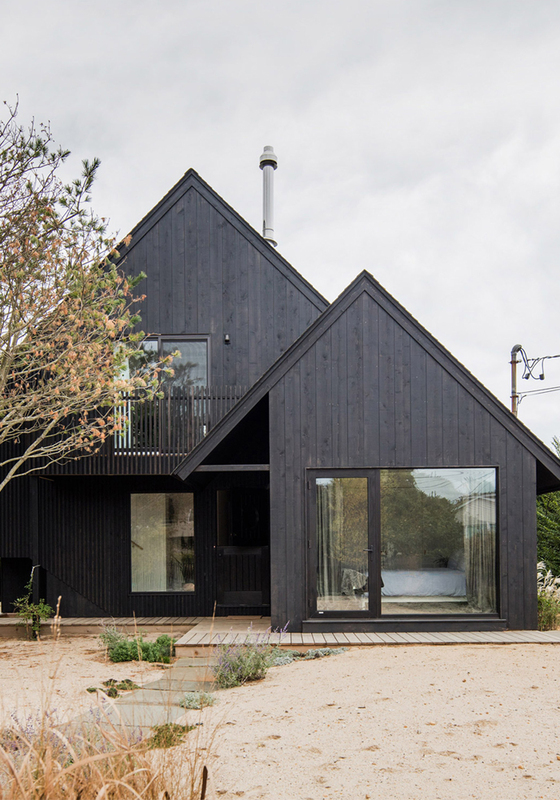 Shiplap black cedar is laid vertically across the exterior, while the extension is lined with a “corduroy” of cedar battens. Walking distance from the beach, the house spans 1,905 square feet (177 square meters) and was renovated for a young family who lives in New York City’s West Village. T W Ryan Architecture retained most of the original outdoor structure but transformed the inside into a spacious open-plan living space with plenty of natural light. Talk about a great space to spend the Summer with friends and family! White painted timber inside always adds to the beachy feel of a house. The other feature I really like in this house is the sliding door fitted in the bathroom which opens up onto another shower outdoor, which is perfect when you’re all back from the beach. Funny how you go for the American double door refrigerator and for me it took everyhing to find an European fridge, narrower, less depth and taller because my kitchen is small and the old fridge was sticking out. And it looks so good! I love that dining room table, that inspired me.